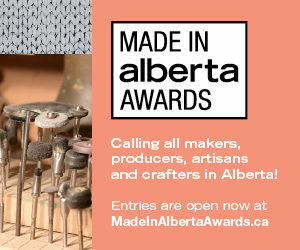 When you consider that tiny Japan has more than 3,000 known hot springs, while huge Canada has around 140, give or take, it’s practically a miracle how many of ours are (a) right next to highways and (b) exactly where you would have chosen to put them as a handy complement to our favourite forms of winter recreation. 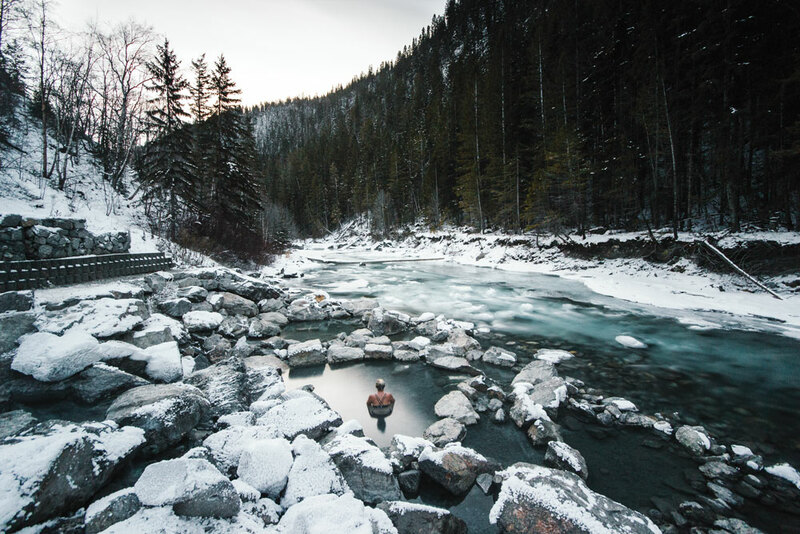 Indeed, the frigid months are the best time to discover (or rediscover, in the case of snobs who tell themselves that communal hot springs are somehow gross) the benefits of a hot soak after a day of cavorting in the snow. 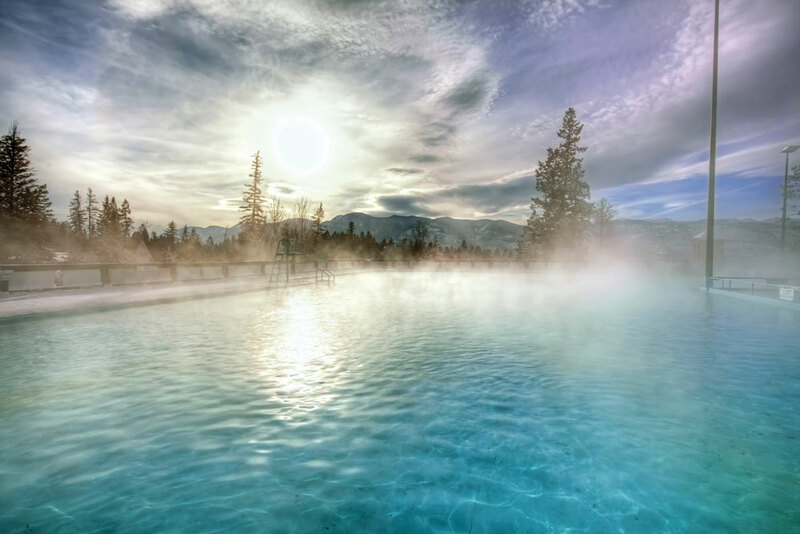 Banff Upper Hot Springs are propitious in every way. Sitting at 1,585 metres, they are the nation’s highest, and their spectacular panorama includes our most-photographed peak, Mt. Rundle. They’re also supremely historic. 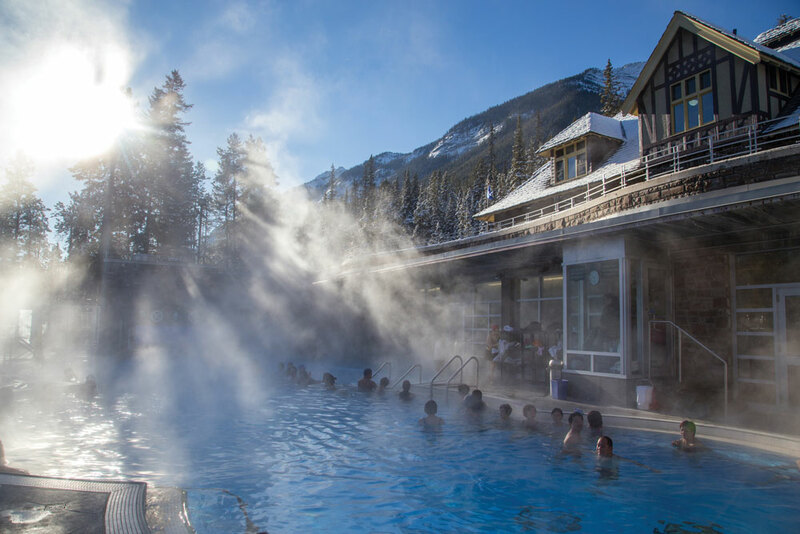 Commercial operations at the Upper Hot Springs date back to 1886, just one year after the establishment of Banff National Park, making this year the 130th anniversary. 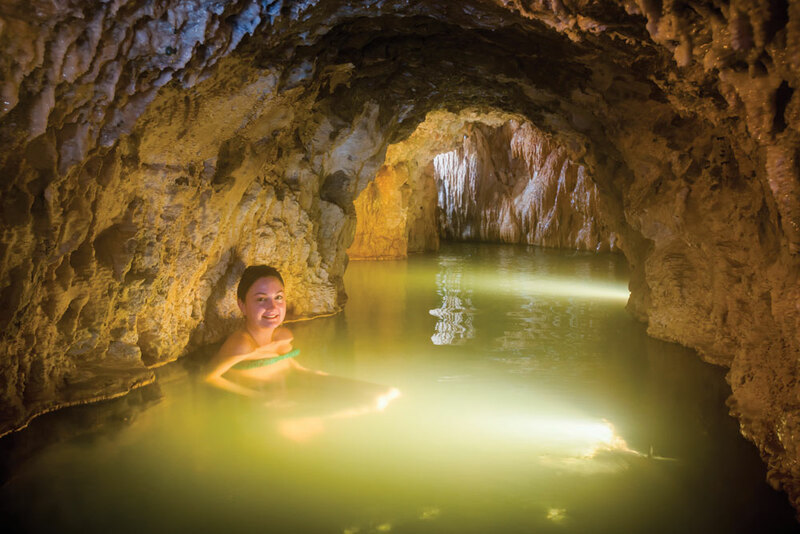 (The lower hot springs, today known as the Cave and Basin, date back to 1882, though the area, part of the National Historic Sites program, is closed to public bathing due, in part, to its status as a habitat for an endangered species of snail.) The 38°C waters of the Upper Hot Springs continue to draw an international clientele, so meeting visitors is part of the fun. And the old-timey rental swimsuits provide a reliable source of merriment. 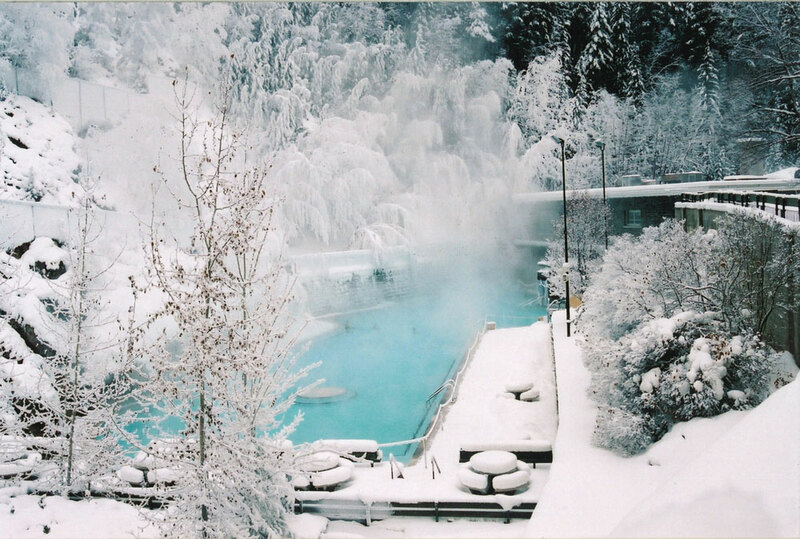 Radium Hot Springs are Canada’s largest, and are literally five metres from the Banff-Radium highway. (A rushing creek tends to drown out the passing vehicle sounds.) Situated in an ochre-coloured slash called Sinclair Canyon, there’s no view to speak of, yet the sheer rock walls make for a dramatic setting unaffected by wind. Radium is, thus, at its best when fat flakes of snow drift gently downward. Besides the soaking pool, there’s a 28°C pool for lap swimming. Although the springs are in Kootenay National Park, you don’t need a Parks Canada permit to visit. Great deal: for a mere $10.55 (for adults age 18 to 64), a day pass lets you come and go as you please. You’ll find Fairmont Hot Springs on the east bench of the Columbia Valley, an area known for its sunny days, even in midwinter. Guests at the resort’s hotel have full access to the connected series of pools, which range in temperature from 30 to 39°C. There are even diving boards – definitely a novelty activity in a driving blizzard. Climb the hill to visit the rustic tubs of the historic Indian Bath House structure, or soak your feet in the nearby pools. Ainsworth Hot Springs Resort, close to Kootenay Lake Ferry, may be a bit of a schlep for Calgarians, but it’s a must if you’re riding at Nelson’s Whitewater Ski Resort. The marquee feature is a steamy, horseshoe-shaped cave that encourages soakers to wriggle back into what feels like the bowels of the earth. Near its entrance, an icy mountain stream tumbles into a cistern where hardy bathers can perform a healthful (if breathtaking) plunge. Then there are the wild and natural thermal outflows like Lussier Hot Springs in Whiteswan Lake Provincial Park, southeast of Fairmont Hot Springs. Just 18 kilometres up the year-round logging road toward Whiteswan Lake, Lussier is a series of hot ponds (one of them almost too hot) beside a rushing river. Although at prime times crowding can be an issue, its advantage is that it never closes. At 3 a.m., you’ll probably have it all to yourself.